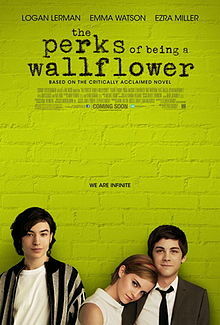 "The Perks of Being a Wallflower" by Stephen Chbosky is one of my favorite books ever. I even have a tattoo dedicated to it. As such, I was super scared that turning the book into a Hollywood movie would ruin its essence. Since I cried every time I watched the trailer, I didn't expect the movie to bomb. However, I didn't expect to like it as much as I did, either. As a movie on its own, Perks did a great job in making an impact on me. It probably has something to do with the fact that the actual writer of the book also wrote the screenplay, but it unfolded very nicely. I even liked the ending - the only bit of the book that I really hated with a passion. Spoilers (highlight to read): In the movie, Sam gives Charlie a typewriter and types, "Write about us." He replies with, "I will." WHY, CHBOSKY? WHY? If you've known me for quite a while, you should know that I worship David Bowie. David Bowie is my God. It even says so in my signature on When in Manila. So, you'd think I'd love that they used "Heroes" for this scene. Well, I didn't. First of all, out of all of Bowie's songs, "Heroes" is probably one of my least favorite. Second of all, it definitely doesn't sound infinite. In the book, the tunnel song is "Landslide" by Fleetwood Mac. If you don't know it, YouTube it. And then close your eyes and imagine the tunnel scene. That is what infinite is supposed to sound feel like. The good news is that they did pretty well with the rest of the soundtrack. I have a Perks playlist on Speckles (my Mac) and it is aptly named "One Winter" and I am glad that they were able to get "Asleep" into the movie. Even "All Out of Love" worked for me despite it not being in the book. Another thing that the movie did well in was the cast. There is not a single cast member I would change. And that's saying something since I used to envision Justin Bieber with long hair as Charlie. Although Emma Watson clearly had difficulties keeping her American accent, it still worked. And I wouldn't change a single thing. As a whole, I believe everybody will be able to relate to Perks on some level. It is touching, sad, heartfelt, funny and inspirational - just like life itself. Although it is lacking a lot of great quotes from the book, it still has enough of them for me to say that it did the book real justice. I guess it also helped that I watched the movie with people who actually make me feel infinite in real life. :) 4 out of 5 stars. I'd watch it again. What did you think of the movie? And have you read the book? :) Let me know your thoughts! I haven't seen the movie nor read the book but I am planning to. I bought the ebook version and I have it in my ipad. Thanks for this. Excited to read the book. Anong ending ng movieee? Tell me!! Hahaha i like spoilers hahaha. I didn't really like the ending of the book also pero I didn't really hate it that much. kill me now, but i didnt really like perks of a wallflower THE BOOK so even if almost everyone's saying the movie is greater than the book, i am not at all excited. :D although, for emma watson, im very curious to see the film. i still dont know though.